NOTES: Multimedia kit with resin and photo-etched parts. When World War II ended in 1945, there were still around 40 of the nearly 1,880 CR.42s still extant. Rather than scrap them, it was decided that these would make excellent training aircraft, so approximately half of them were converted into two place aircraft. This was done by stretching the fuselage 12.6 inches and putting in a second cockpit. The contents of the front and rear cockpits were identical in all regards so that they could be flown from either seat. All the aircraft were painted in an overall aluminum color and continued in service until the late 1940s when maintenance made them difficult to keep airborne. 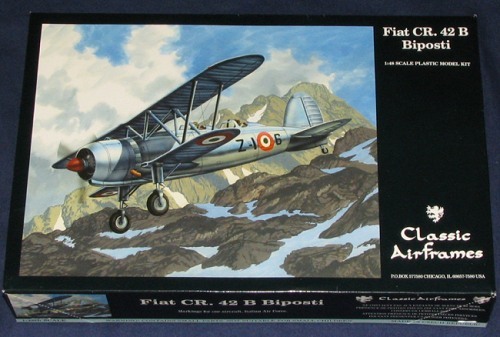 This is basically Classic Airframe's standard CR.42 with an additional sprue for the two seat fuselage. 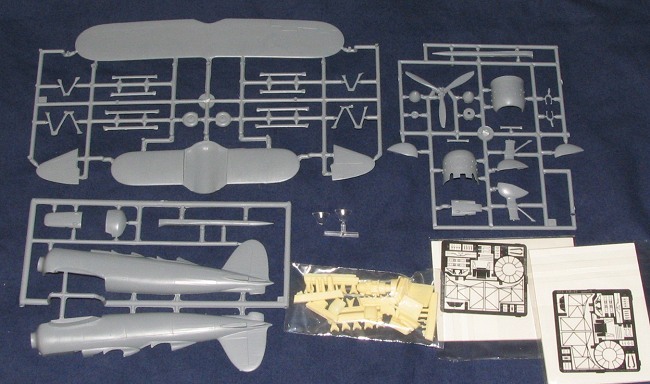 There is also an additional clear sprue as well as a second etched fret and additional resin bits in order to make up the second cockpit. Overall molding is quite good and, as you can imagine, there are a few bits not used. Specifically the enclosed spinner and the enclosed wheel spats. This means a bit of cutting in order to properly attach the open main wheels. The builder will also have to cut away the forward section of the lower wing as well. Instructions are a bit of a mix of the single seat and twin seat builds. There is a new sheet insert covering the majority of construction that shows the two seat aircraft. Those bits that show wing and landing gear assembly are for the single seat aircraft as this is identical in both variants. The small decal sheet is provided for one aircraft from 1st Zona Aera Territoriale, Milan, 1946. It is overall aluminum with basic roundels and fuselage codes. The red spinner is the only color provided. I'm sure that some research can turn up other features, but all I could find was a single photo in the 'in Action' series. The decals are very well printed by Mmicroscale and should provide no problems. This pretty well seems to cover all the CR.42 variants except the CR.42DB, a one off that was powered by the Daimler-Benz DB.601 engine. This is a neat aircraft, regardless of the variant done and the added interest of the two seat version should spark quite a bit of conversation when shown. It's lack of heavy-duty rigging also makes this kit one that many who like biplanes but have rigging phobia will want to give a try.